This is our most popular and cost effective service. Sketch guidelines can be downloaded, for free, from our simple guidelines page, as well as a template for sketches. Please use these. If you then need further help please feel free to 'phone on 0113 258 7607. Draft copies are faxed back and final copies are e-mailed within 48 hours. 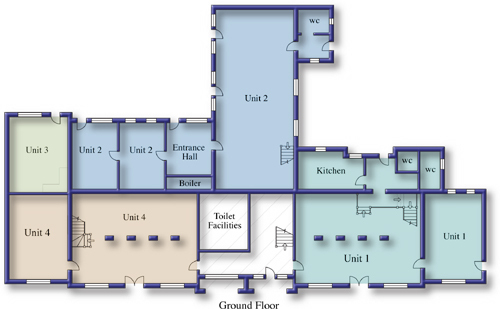 Sometimes for a big property or development you may need an overall site plan. No worries, send us what you have and tell us your requirements. If you have existing plans already drawn on paper or disk we can redraw to your requirements. If you need for submission with a lease pick up the phone and call us on 0113 258 7607. We currently supply all Lease Plans for one of the largest borough councils in the UK. Maybe you're a developer who has plans produced on CAD that you want hand drawn or simply converted for marketing purposes. Yes, we can convert and enhance your plans for you. All the above services can include colour and duplicates in specific file formats for use in different media eg; print & web. 48 hour turnaround time applies unless otherwise agreed.